From classics such as "House of Wax" to more modern films in the vein of the campy "Hocus Pocus," there are films and TV specials that we seem to come back to every Halloween season. Hundreds of monster movies, fantastical films and silly specials can be seen on TV in the coming weeks, and many more are available on home video. We asked Journal Gazette readers to share their favorites with us via email and social media. Letty Roeth of Fort Wayne discovered a favorite during a Saturday matinee in her youth. Disney’s "The Legend of Sleepy Hollow" features Bing Crosby narrating the story of Icabod Crane and the Headless Horseman. It was originally part of a 1949 animated package film, "The Adventures of Ichabod and Mr. Toad," which featured two segments: "Sleepy Hollow" and another based on "The Wind in the Willows" that was narrated by Basil Rathbone. The movie won the Golden Globe for Best Color Cinematography in 1950 before the segments were separated to be shown individually a few years later. Roeth says that when her children were young, her family threw "epic Halloween bashes," and the kids would wind down with a showing of "The Legend of Sleepy Hollow." Watching the animated movie became a family tradition. "Our adult children still watch every October, and my guess (is) the tradition will continue," she says. If you can’t find "The Adventures of Ichabod and Mr. Toad" on television, the feature is available on DVD and Blu-ray. "Sleepy Hollow" isn’t the only childhood favorite that spawned a family tradition. "Halloween is Grinch Night" debuted as a TV special in 1977 when local resident Brenda Mossbarger was a child in Wisconsin. She says she looked forward to watching it each year, and she continued that tradition with her children and grandchildren. "Last year we had a Halloween movie sleepover with granddaughters," she says. "First up was ‘Halloween is Grinch Night,’ followed by ‘Hocus Pocus’ and ‘Beetlejuice.’ "
"Grinch Night" won an Emmy for Outstanding Animated Program and has been released on DVD as part of several Dr. Seuss collections. One family-friendly favorite you won’t have any trouble finding on TV features the Peanuts gang. Charlie Brown and friends first set out to celebrate Halloween in "It’s the Great Pumpkin, Charlie Brown" on Oct. 27, 1966. As the gang goes to a Halloween party, Linus hunkers down in a pumpkin patch to wait for the Great Pumpkin, which never rises. For Peter Greer of Hicksville, Ohio, there are bittersweet feelings about the TV special, which he says was his first lesson in disappointment as a child. "At the end of my initial viewing, I cried, knowing that poor Linus would always be hurt waiting for someone that didn’t exist," he says. "That should have killed any desire to see it again, but like Charlie Brown and the football, I keep coming back every year despite the fact that it always turns out the same way." Of course, there’s more than family-?friendly fare out there, ranging from snarky to scary. Though lots of adults return to horror films year after year, David Sowards of Fort Wayne says he doesn’t see the point. "I usually do not watch those more than once because there is no surprise or shock the second time around when you know what’s going to happen and how it’s going to end anyway," he says. If you’re looking for a non-horror special aimed at adults, Sowards recommends "Gary Larson’s Tales from the Far Side." The 1994 animated short film was first shown as a Halloween special on CBS. It was made available on DVD along with a 1997 sequel, "Tales from the Far Side II." "Unlike most animated shows, this one was definitely not recommended for children," Sowards says. "However, while it may have not been for all tastes, it certainly was memorable for its uniqueness, and I haven’t seen much to compare to it." If you’re looking to flip on the TV for a monster movie or silly special in the next two weeks before Halloween, there are plenty of things you can catch. But beware, times included below are based on information released by networks and are subject to change. The children in your family might be too young for many of the rest of the programs you’ll find in this story, but here are a couple of specials they can enjoy. 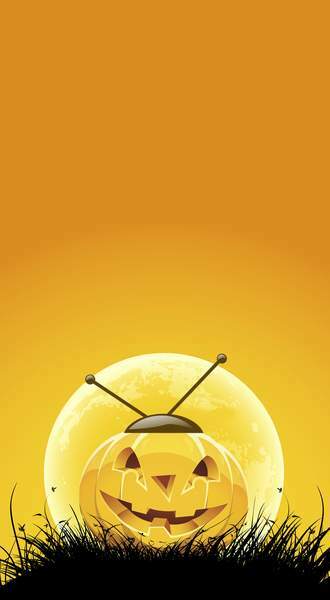 • Camp out in a pumpkin patch with the 1966 classic "It’s the Great Pumpkin, Charlie Brown" when ABC shows a shortened version of the special at 8 p.m. Tuesday. A full-length version airs at 8 p.m. Oct. 29 in an hour of programming that includes "You’re Not Elected, Charlie Brown." • "Toy Story of Terror" (2013) can be seen at 8:30 p.m. Tuesday on ABC as well as 11 p.m. Saturday, 6:30 p.m. Oct. 25, 9 p.m. Oct. 26 and 7:30 p.m. Oct. 27 on ABC Family. Nothing quite screams Halloween like screaming during "Halloween." If horror films are your thing, there are plenty of them on cable channels in the coming days. Here is when you can catch a few of the most prominent franchises. • "Halloween" – Watch out for Michael Myers and other frights as AMC shows films from the "Halloween" franchise several times. Among showings, the original "Halloween" (1978) can be seen at 7 p.m. Oct. 28 before a marathon Oct. 29 starting with "Halloween II" (1981) at 4 p.m., "Halloween III: Season of the Witch" (1982) at 6, "Halloween 4: The Return of Michael Myers" (1988) at 8, "Halloween 5: The Revenge of Michael Myers" (1989) at 10, "Halloween 6: The Curse of Michael Myers" (1995) at midnight and finally closing out with "Halloween: Resurrection" (2002) at 2?a.m. Oct. 30. • "Poltergeist" – Keep the lights on for "Poltergeist" (1982) at 8:30 p.m. Oct. 30, followed by "Poltergeist II: The Other Side" (1986) at midnight on ABC Family. • "Friday the 13th" – AMC sets Jason Voorhees loose on Oct. 27. "Friday the 13th" (1980) starts things at 6 p.m., followed by "Friday the 13th, Part 2" (1981) at 8, "Friday the 13th, Part III" (1982) at 10 and "Friday the 13th: The Final Chapter" (1984) at midnight. As the marathon continues overnight, "Friday the 13th – A New Beginning" plays at 2 a.m. The 2009 remake of "Friday the 13th" can be seen Oct. 28 at 5 p.m. on the network if you want to record both films to compare and contrast. • "Saw" – IFC has a marathon of movies from the "Saw" franchise Saturday with "Saw II" (2005) at 5:30 p.m., followed by "Saw III" (2006) at 7:30, "Saw IV" (2007) at 10 and continuing with "Saw V" (2008) at 12:15 a.m. "Saw: The Final Chapter" (2010) can be seen at 7 p.m. Oct. 30 on IFC. Franchise frights come in all shapes and sizes. Looking for something you don’t have to watch with the lights on? There’s something for you, too. • Vampires and werewolves rage when Syfy shows the first three installments of the Underworld horror series tonight. "Underworld" (2003) is on at 6:30 p.m., followed by ­"Underworld: Evolution" (2006) at 9 and "Underworld: Rise of the Lycans" (2009) at?11. "Evolution" and "Lycans" play again Monday starting at 7 p.m.
• ABC Family has "The Addams Family" (1991) and "Addams Family Values" (1993) back-to-back on ABC Family at 7 and 9 p.m. Wednesday, 4 and 6 p.m. Thursday, 4:30 and 6:30 p.m. Saturday, 2:30 and 4:30 p.m. Oct. 25, 7 and 9 p.m. Oct. 29 and 2:30 and 4:30 p.m. Oct.?30. • Hallmark Channel marathons five movies from "The Good Witch" franchise on Saturday starting at 11?a.m. The movies will be followed at 9 p.m. by two new hours from the TV series that the movies spawned. The episodes replay Oct. 25 at 12:30 and 9 p.m.
• Tim Burton films come in pairs on ABC Family as "The Corpse Bride" (2005) and "The Nightmare Before Christmas" (1993) show back to back at 11 a.m. and 1 p.m. Saturday and 9 and 11 a.m. Oct. 25 on ABC Family. Then the network pairs "Nightmare" with "Frankenweenie" (2012) at 9 p.m. and midnight Oct. 26 and 4 and 6 p.m. Oct. 27. The heyday of paranormal reality shows may be waning, but there are several new episodes you can catch next week. • Syfy’s "Ghost Hunters" investigates the legend of a love triangle at Southern Vermont College at 9 p.m. Oct. 28. • "Paranormal Witness" details the story that is the basis for the 2013 movie "The Conjuring" at 10 p.m. Oct. 28 on Syfy. The movie itself is televised at 9 p.m. Oct. 31 on Syfy. • The cast of Destination America’s "Ghost Asylum" will appear in the network’s "Exorcism: Live" starting at 9 p.m. Oct. 30. • Travel Channel’s "Ghost Adventures" will have a two-hour special Oct. 31. There are several new offerings including special episodes, a new movie and the debut of a series based on a horror franchise. • ABC Family’s "Stitchers" debuts a special Halloween episode at 9 p.m. Tuesday. • "The Simpsons" con­tinues its annual tradition with "Treehouse of Horror XXVI" at 8 p.m. Oct. 25 on Fox. This year, Sideshow Bob eliminates Bart. In another segment, several Springfield residents gain superpowers. • A myserious creature terrorizes a secluded island town as Syfy premieres an original movie, "The Hollow," at 9 p.m. Saturday. • Bruce Campbell reprises his titular role as "Ash vs Evil Dead" launches as a TV series on Starz at 9 p.m. Oct.?31. • Netflix’s "Hemlock Grove" monster series posts its third and final season Friday. There are literally hundreds of opportunities to catch spooky movies in the next two weeks, so check the listings from your TV provider to see what’s on at any given moment. This list of at least one movie per day through Halloween should at least help get you started with your viewing schedule. • Guillermo del Toro’s new movie, "Crimson Peak," opened Friday. • Jack Black stars in "Goosebumps," which opened Friday. • "Paranormal Activity: The Ghost Dimension" is scheduled to open this week.